In my recent blog dated December 7, 2017, I mentioned that the MLP stocks (and most oil stocks in general) were at an important juncture, after underperforming the stock market for two years in spite of recent strong oil prices, good earnings, and continuing low interest rates. If you look at the two charts below, it appears there is very good evidence an important bottom is in. This is important to retail and wholesale fuel and c-store owners because it impacts M&A activity and often store selling multiples in general. 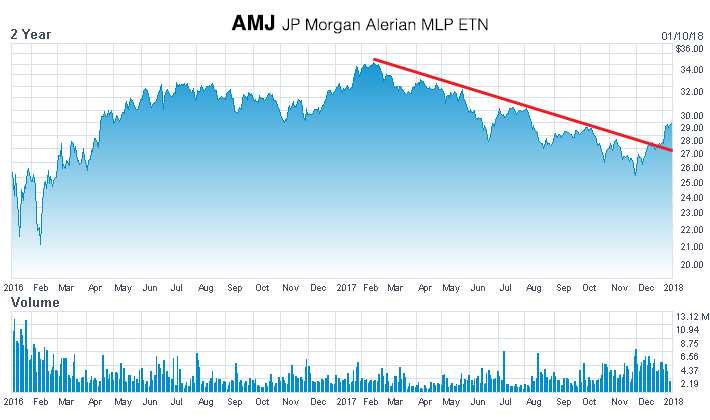 First, look at the chart of AMJ (JP Morgan Alerian MLP ETN), which is designed to represent the overall public debt valuation of the MLP companies. Note it has broken to the upside and with good buying volume. The competitive High Yield debt market in general has held together rather well. And Trump recently announced some easing of lending standards for banks that could give them more flexibility to lend and perhaps allow over leveraged MLPs some flexibility going forward. Certainly offsetting somewhat is the likelihood that rates are rising due to a stronger world economy, and the fact that US Federal deficits are expected to rise, at least short term. At some point, the rising rates will hurt and usually it is seen first in the High Yield market, but that has not happened as yet. 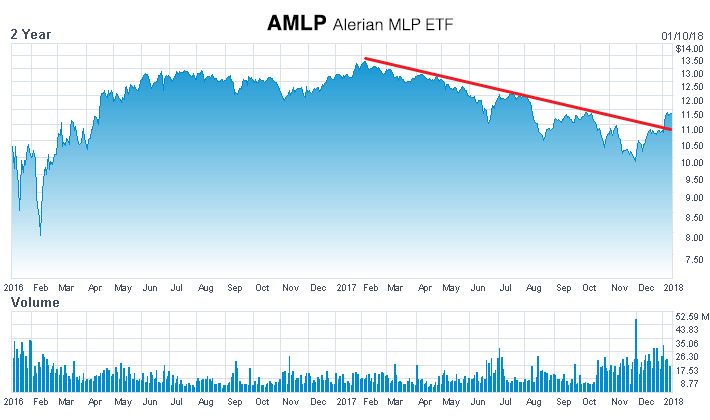 Next, interestingly, you can see how the chart of AMLP (Alerian MLP ETF), a good proxy for the overall MLP stocks, is showing a very similar pattern. Perhaps not surprising since growth and debt availability is a key to rising MLP stock valuations, as they are expected to keep raising distributions to justify their multiple valuations. As a bit of an aside, note the very large volume of trading towards the end of 2017. Perhaps the public got discouraged with their weak stock performance and chose to sell for tax losses to offset other stock gains? If true, it probably put more MLP stock in institutional hands, but perhaps that was overdue because the MLP stocks are all quite different and tricky for the public shareholders to fully understand. With overall MLP distribution rates averaging about 8%, I feel there is considerable upside for MLP stock prices, which move inversely with these distribution rates. In the meantime, both oil prices and the stock market have continued to perform very well, so we'll see if it's time for better activity from MLPs and oil stocks in general. What do you think?